Fountain Valley is one of the fastest growing areas in the region and offers some of the most affordable housing that can be found. Great foreclosure deals are frequent here, and many single family homes list for under 100K. There is a great diversity of options here with numerous new home and townhome developments as well as single family homes built from the 50's through the 80's as well as large properties with plenty of privacy. Being adjacent to one of the main gates of Fort Carson, Fountain Valley has the highest concentration of military families. Some of the popular neighborhoods in the Fountain area are Painted Sky at Waterview for some of the newest homes, as well as the Countryside neighborhoods for great, affordable foreclosure homes. To the northeast, the Colorado Centre neighborhood and Cuchares Ranch make an easy commute to Peterson AFB and Schriever AFB. Other popular neighborhoods in the Widefield/Security area are Fountain Valley Ranch, Barnstormers Landing, Lorson Ranch and The Glen at Widefield. The Fountain Valley area offers all the amenities a person could want. The northern areas are easily accessible to shopping, dining and movie theaters along S. Academy Blvd. Southern areas are served by numerous shopping centers along Hwy 85/87 as well as at Mesa Ridge Pkwy. Fountain offers many exciting Festivals and events such as the Thunder Valley Car and Bike Show, the Harvest Moon Festival and Haunted house and the Fountain Valley museum and the Pikes Peak International Raceway is just to the south. The Fountain Valley area also offers some great parks and recreational facilities. The Bluestem Prairie Open Space is located here offering great trails and wildlife viewing and the Fountain Creek Nature Center is a nationally recognized birding area. Metcalf Park is a 36 acre park that features a BMX jumping track, skate park and a riding and roping arena while the Fountain Fort Carson Sports Complex features an astro-turf playing field as well as a swimming pool, two gyms, a weightroom and various soccer, softball and baseball fields. 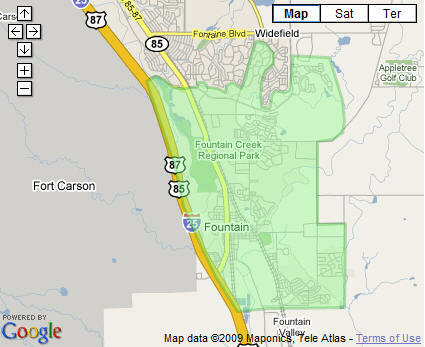 The Southern portions of Fountain Valley are served by the Fountain-Fort Carson School District 8. In addition to its rich athletic heritage and close relationship with the military, D8 is committed to “Developing Generations of World Class Learners”. Students here attend Fountain-Fort Carson High School. Northern areas are part of Widefield District 3, which has the unique distinction of operating its own parks and recreation district. Fountain Valley is one of the hottest places for great foreclosure deals in the region. This combined with great shopping and entertainment, proximity to military bases, fantastic parks and recreational opportunities and great schools makes a foreclosure deal here a great find. Click here to search all Fountain Valley homes for sale.